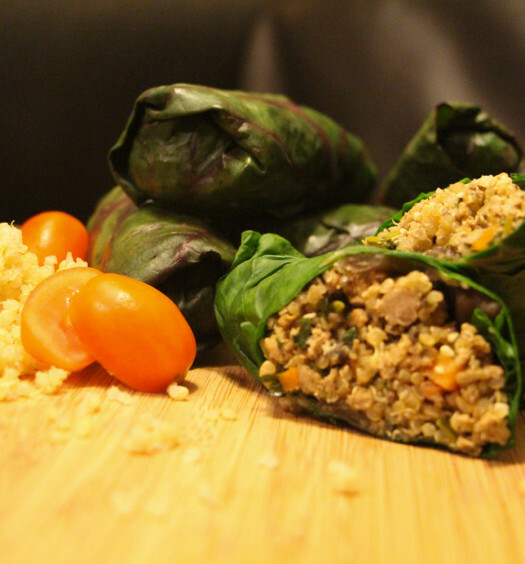 Quinoa left overs are like finding gold in your fridge. I find Quinoa to be super versatile as it’s flavour base is just a little nutty but the grain itself can adapt to many flavours. Along with flavour soakage, the grain can be transformed into so many things. 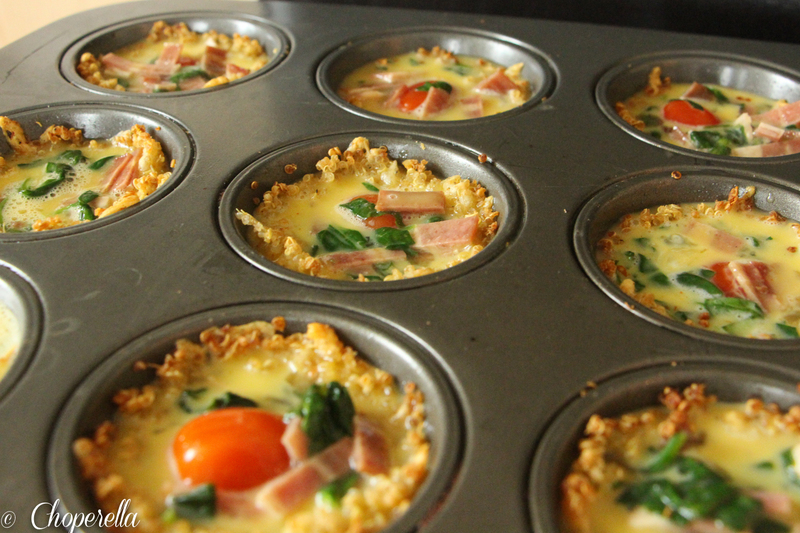 So this time I was making breakfast and decided to make quinoa crusts in a muffin tin, then fill them with eggs, bacon and spinach. 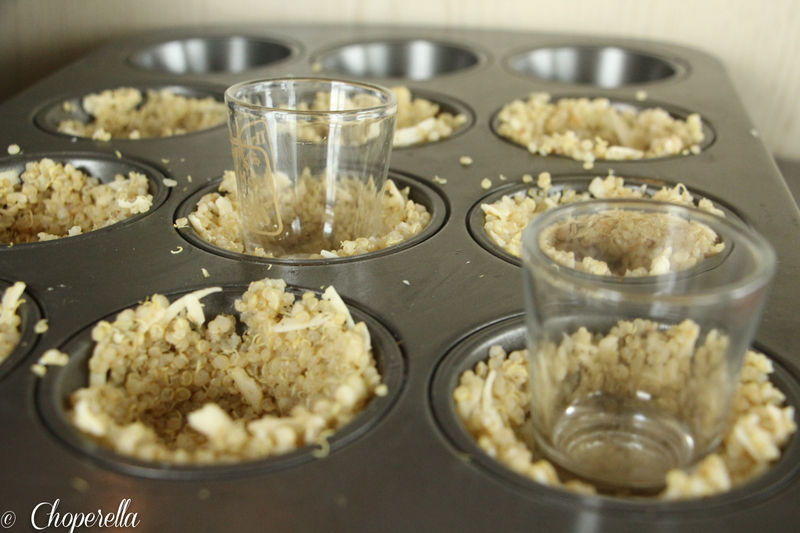 I tend to use whatever tools I have on hand to perfect the dish, this time- shot glasses. I used them to shape the crusts. The crusts alone can be used and then filled with your favourite dip, salsa, guac etc. See versatile! I just got an idea for an appetizer! 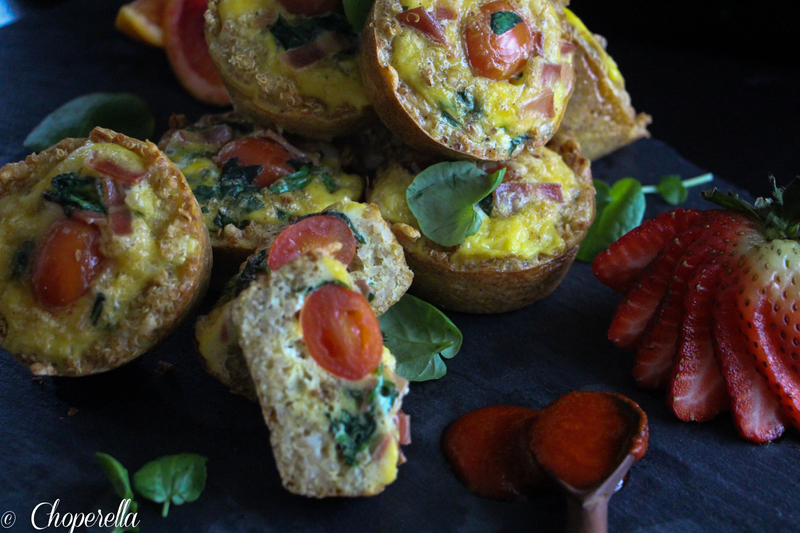 These Quinoa Crusted Quiches are simple, easy and most of all so delicious. They’re portable and easy to eat on the go too. Feel free to change the vegetables and the meat choice or make them purely vegetarian. 1. Pre heat your oven to 425. Grease a muffin tin well with cooking oil or spray. 2. In a bowl, combine the quinoa, chickpea flour, 1/2 tsp salt, 1/4 tsp pepper and water. Mix until well combined. The mixture will feel a little sticky. If too sticky and can’t get it off your fingers, add a touch more chickpea flour. 3. 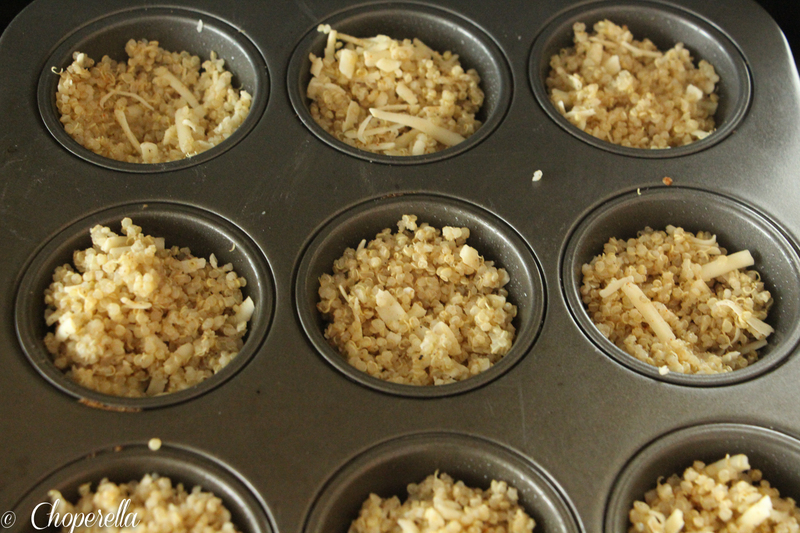 Place 1/4 cup of the quinoa mixture in each muffin tin . Gently, push the middle down and then out to the sides to form a cup. Use a greased shot glass to help so you don’t make any holes. Use the shot glass to gently flatten and evenly coat the sides. 4. 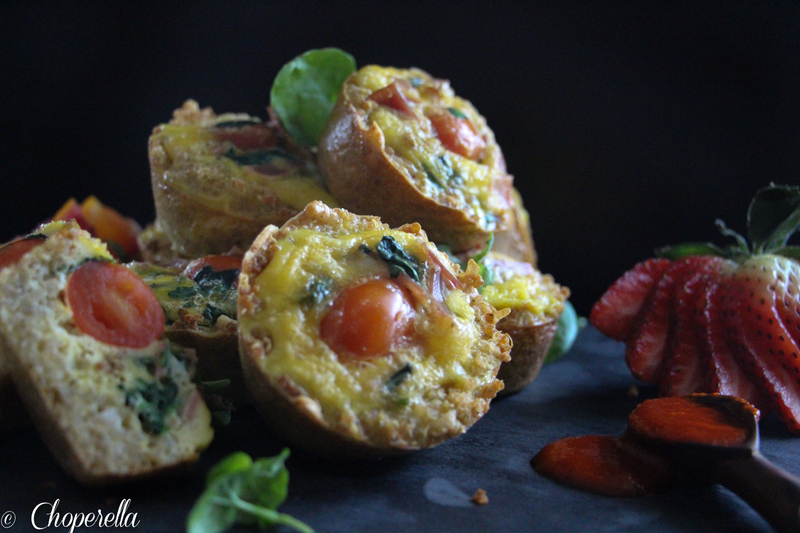 Once the oven is pre-heated, bake the cups for 15 minutes, until the edges are nicely browned and crispy. 5. While the cups are cooking, prepare the egg mix. Whip the eggs, add in the bacon, spinach, salt, pepper, chili powder and cumin powder. 6. When the cups are cooked, pull them out of the oven. Turn the oven down to 325. Fill the cups with the egg mixture about 3/4 of the way. Place one grape tomato in the middle of each cup. 7. Turn the oven down to 325 and bake for 15-20minutes until the egg is set. 8. Once cooked, let them cool in the pan for 2 minutes and gently take them out with a spoon. Serve immediately. 9. Store any leftovers in an airtight container. Simple reheat in the microwave for 45 seconds and enjoy!